Buck is not just an extraordinary man – which he is. Buck is an extraordinary movie. Seeing Buck in Buck is an uplifting experience. 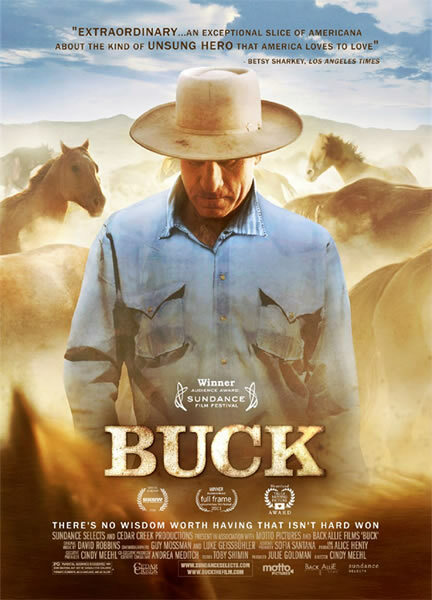 Buck’s “love in action” brings the audience as well as his horses and their trainers into a profound realization of relating as well as healing. Buck keeps circling back to a key message for all of us. We first have to get ourselves in order before we can get anyone else or any horse in order. Once we can feel ourselves grounded in a sense of well being within ourselves and in our relations with others, once we can get in charge of our emotions in stressful circumstances and once we can acknowledge the importance of evolving as we live our lives, we can accomplish much more in the world than we imagined would be good enough. Buck – man and film – embody a sensibility of love that celebrates the desire to please and to be someone who is worthy of being pleased by others. It’s a message carried by the sound bite “Be All That You Can Be” but goes further to illustrate exactly what that means when the chips are down. When faced with difficulty, we have to become more to deal with it. A larger, more skillful respectful love is required. In particular, Repeatedly he shows that spirit is a nature-given plus lying beneath a block of fear that once released is a beautiful thing to behold. Releasing spirit is Buck’s gift. Showing him in action while releasing spirit from a scared animal in mild, ordinary and extreme situations is a profound sight not to be missed. We see him walking a horse through complicated maneuvers with a gentle turn of his body. We see him riding his horse dancing like a ballerina in a field of green grass. We see him urge a deadly stallion into a horse trailer without raising a whip. We see a live demonstration of kindness merged with discipline as he teaches with a firm hand and a loving heart. Sadly, the deadly stallion was beyond even the help of Buck but its owner learned enough about herself to know that putting the horse down was a better choice than having him beaten mercilessly by another owner. A limit can be a worthy adversary, a provocation to open our hearts and expand the meaning of love beyond what we’ve known it to be. Seeing is believing. That’s what movies can do. They can change your life. Bring you into a fresh realization of yourself. Some movies. Some movies turn a story into more than a story. They turn story into myth. When I see a film like Buck, I feel like I’ve touched an ether wind, the invisible wind that brings light to earth. Myth is not a lie. It’s a living presence that guides and informs and sustains the spirit of being alive. I feel more in sync with my own nature as a result of seeing Buck. As the man says, to train horses means learning more about ourselves than about horses. In particular, Buck makes the point to stop mistaking fear for who we are and for who others are. Bad behavior is not evidence of evil or worthlessness. It’s not an invitation to be harsh. It’s self-protection coming from a darkness of mind that can be eased in most cases – not all – by learning to feel safe. Buck transforming bad behavior into a thing of beauty reminds me of Luke Skywalker learning to follow the force. Beyond fear is spirit, a through line to love of being.